DOG FIT by PreThis® CARE senior for old dogs of all breeds and sizes, with precious and purely natural ingredients for an all-round care for the skin, coat, bones, joints, eyes, digestion and metabolism. DOG FIT by PreThis® CARE senior support you with the holistic health of your senior dog by a unique combination of nutrients for the skin, coat, bones, joints, eyes, digestion and metabolism. Also in the old beacon to stay healthy the body of a older dog needs many different nutrients. Especially the joints and bones, but also skin and coat are instructed for these special nutrients for older dogs. Also the gastro-intestinal tract, the eyes, the teeth or the metabolic in the phases of increased load or with increasing age need friendly and effective support. The normal food supply unfortunately not always cover the requirements completely. An important role for the health of the skin and coat (e.g. in the event of a scaly skin and dull skin), but also for healthy eyes and an active metabolism play the stabilizing and invigorating hyaluronic acid, as well as the antioxidant vitamin E, the cells against free radicals and oxidative stress and also protects the vision of calls. In collaboration with MSM, glucosamine and chondroitin the cartilage structure is also strengthened as well as the formation of synovial fluid stimulated and inflammation in the joint is relieved. In addition included calcium is an important part for the health of the bone structure and of the dentition. DOG FIT by PreThis® CARE senior is specially designed for older dogs and an all-in-one supply of the animal organism with many important ingredients. As DOG FIT by PreThis® CARE senior is free of gluten, lactose and fructose, it is extremely well tolerated also for sensitive dogs with food allergies and can be easily administered over a longer period. 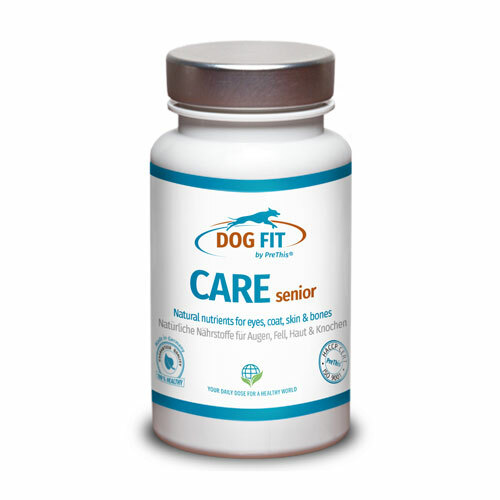 DOG FIT by PreThis® CARE senior is the ideal product to combat typical signs of age and should also be given for prevention in order to avoid the occurrence of health problems and the organism in periods of stress. Order today DOG FIT by PreThis® CARE senior from the original DOG FIT Onlineshop. Category: Products. Tag: prethis dog fit.